David Horsey has written a column sympathetic to President Obama's predicament with respect to Syria. Clearly the president doesn't want to just rush in, no matter how much the congressional hawks are urging him to do so. And, Horsey says, with good reason. The president insists that there is a "game-changing" red line the Syrian government will have crossed if it is found to have used chemical weapons against its people, but he has bent the red line so far, the hawks say, that not only the Syrians, but the Iranians and North Koreans will conclude Obama is a man with a marshmallow spine whose warnings can be flouted with impunity. The president has, indeed, added more caveats to his tough talk. In his news conference on Tuesday, the president said if rock-solid proof is found that a gas attack has taken place he would "rethink" what to do next, choosing from an unspecified range of punitive options that might not include military action. 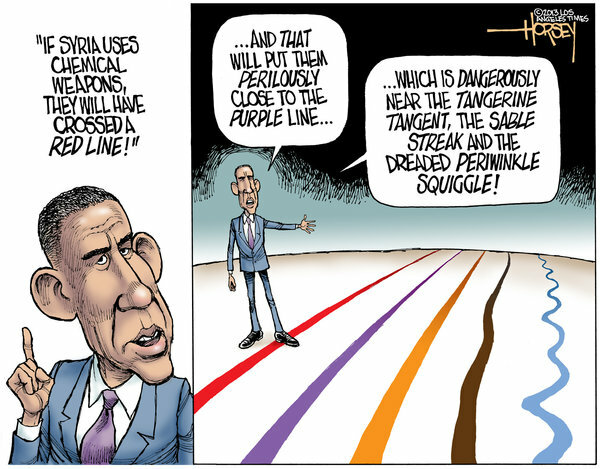 His line got more elastic after last week's ominous but rubbery announcement that U.S. intelligence agencies have found evidence of a possible use of the nerve gas sarin -- somewhere, sometime, against somebody in Syria, "with some degree of varying confidence" (in the words of Defense Secretary Chuck Hagel). "If we end up rushing to judgment without hard, effective evidence, then we may find ourselves in the position where we can't mobilize the international community to support what we do," Obama told reporters. It would indeed be difficult to get other nations and the UN to back the US in any "boots on the ground" scenario. I suspect it would also be hard to get such approval for even non-troop involvement. The rest of the world (including many Zionists) are fully aware of how the Middle East balance, tenuous enough at that time, was fully upset by the NeoCons and remains a problem. There is also the fact that woven into the fabric of the Syrian uprising is a religious issue, something Bush ignored in both Afghanistan and Iraq. Muslims of different strains are fighting each other: Assad is an Alowite; the rebels are Sunni and Shia. This is as much a religious war as it is revolution against a tyrant. In this matter, I agree with the president. This is no time to rush in.